5 Star saddle pads are made from 100% wool for excellent fit and performance. 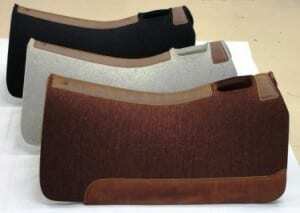 A true French Curve backline and withers slope provide optimal comfort for your horse or mule. 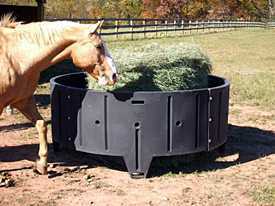 Round Bale Hay Feeder for Horses has no sharp edges minimizing the dangers of cuts or serious injuries. The height of the feeder facilitates feeding and eliminates rubbing off the mane of horses. This popular plastic feeder is designed with all countersunk hardware for horse safety. The 2″ thick walls form a round, 35″ tall, 8`-4″ diameter feeder made with UV resistant material. Barn World sells a wide variety of farm supplies, ranch supplies, livestock feeders, grain bins and equestrian supplies made by American manufacturers. Our best selling items are hay feeders, cattle guards, feed bins, saddle pads, mineral feeders, livestock scales and many livestock supplies. We are one of the top vendors for farm and ranch supply in the United States and pride ourselves on our strong customer service and expertise. Our products are manufactured here in the USA and are made of the highest quality available. Please check out our extensive inventory of online farm and ranch supplies or contact us today.